In November, our therapy team visited Simeon (Shi Wenjia) at his home orphanage in Shihezi, Xinjiang in western China. During the three-day visit, our Therapy team toured the welfare home and delivered Simeon’s wheelchair and his standing wheelchair. 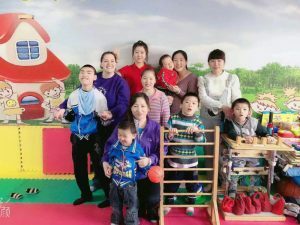 We were also able to provide individualized therapy training for Simeon and other children in their therapy program, and we provided therapy training to the three therapy nannies who work at the orphanage. Simeon is currently receiving therapy five days a week for three hours a day—one hour of physical, occupational and speech therapy respectively. Although there is no school at this welfare home, he is learning a lot in therapy. His therapy nanny has received some prior therapy training and has been able to set achievable goals for Simeon. He continues to work on crawling, standing, and strengthening his upper and lower extremities. He can now mimic words and phrases with 50% accuracy, and his oral motor skills have greatly improved also. In addition to all of this, we’re happy to report that the residual tumor that was a result of his myelomeningocele operation has gone down considerably. Fantastic news! Overall Simeon is receiving excellent care and is making wonderful progress. Our therapy team plans to make a return visit sometime this summer.